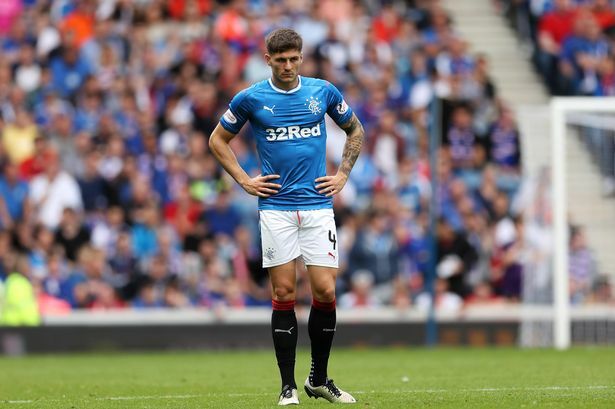 Rangers manager Pedro Caixinha effectively confirmed the axe for maligned ‘defender’ Rob Kiernan, who has been absent from first team affairs for months. The 26-year old ex-Wigan stopper had a torrid time in the SPL and struggled to cope with the step up in class, and his manager has basically admitted his time is up at Ibrox. No mention whatsoever of Kiernan who now seems absolutely certain for the exit, while Caixinha sees Wilson as continuing to be an integral part of defence. Kiernan really did turn out to be a horrific defender for Rangers, struggling in his entire time at Ibrox to convince anyone, and it seems Caixinha agrees entirely having surely assessed him. I think we should all thank Rob for his efforts, wish him success in his future career and I mean that in the best of intention too. He was found out on many occasions to be lacking in many departments as a centre half and my only praiseworthy comment in his favour was that he was asked to play in a role Warburton had set in stone whichever Kiernan hadn't the ability to handle. I would say he tried his best, but unfortunately was nowhere near Rangers standards. Well said, agree, he never lacked commitment. Agree wholeheartedly Alan. Players do not pick themselves, in my opinion you can only ask for 100% when they get here, if that turns out to be insufficient, you can hardly blame the player. Will any team pay a fee for him? He could probably do a job for Partick Thistle, Ross County, Falkirk or at Accrington Stanley etc. On the odd occasion, he played all right, but Rangers were too big a club for him to succeed in. Andy Webster is another good example: - He was a decent centre half with first Arbroath and then Hearts, but was forever getting injured and just not good enough for a team of the stature of Rangers. He was a nightmare. He was forever sleepwalking through a game. He had no awareness either. I'll be glad to see the back of him! Rob was crap and SHOULD be known for his MASSIVE SHORTCOMINGS, whilst employed with GREAT PAY, at RFC, what a dud ! Added value? More like Tesco value. Maybe Warburton will pay for him, or has even he realised that he was never the right player. A goal a game to the opposition bomb scare of a player, not his fault, that lies solely with the previous manager, should never have been playing at Rangers FC...Don't let the door slam. It's a shame that Rob couldn't cut it at Ibrox. He is just another example of the Championship quality player Warburton brought to Rangers. I wish him well in the future! I do have some sympathy for him, believe it or not. He is a decent player with some good attributes and always tried hard. I think he was totally hung out to dry by being on the right side of the DC pairing and having to deal with not just his men, but Tavernier's as well. I don't think it's any coincidence that the central defenders who have had the hardest time this season have been on that side where Tavernier can't defend his way out of a wet poke. Best of luck to him, hope he goes somewhere he can get onside with fans as he is obviously a confidence player and I do think some of the treatment he got from some Bears was awful. No matter the player, we should be behind them unless they are slagging the club. Yes Kiernan did have a torrid time but some times it comes down to the manager not giving the CH the right cover and players around him it also comes down to how fit you are and a manager would know when to play a player and when not to good luck Rob. Crap manager bought a crap player. Simple ! Baws tae Rob Kiernan I'm more interested in this incoming Striker - Morelos aka El Buffalo. That's some bloody record he's got with HJK Helsinki and in European games too..Granted a work permit would be an issue but he's got some potential to make a name for himself and earn the Gers some silverware this season..
signings we have and the others that are still coming come on second for get it num 1 we are going for no one can stop us now i believe in Pedro now.